Food is pretty straightforward. I took at look at what Cupcake eats every day and determined it wasn’t going to be practical for the road. She eats a frozen, raw diet, but for travel, we take a freeze-dried raw diet instead. 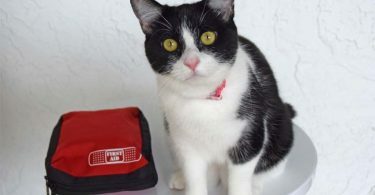 It’s simple to mix that up with warm water and serve it in have some silicon pop-up bowls that I usually keep in the side pocket of her carrier that will do well as serving dishes for food and water. 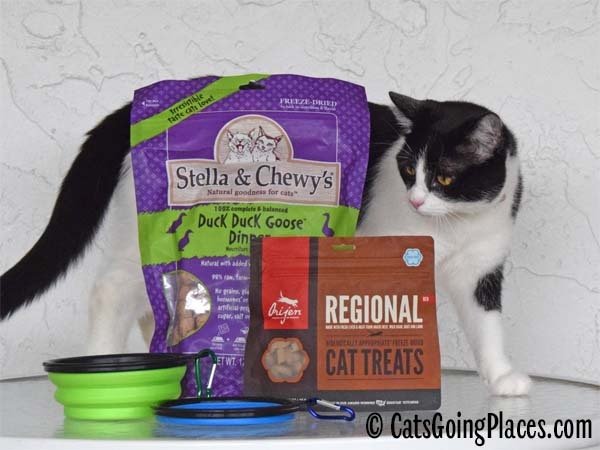 I’m also making sure she has plenty of her favorite treats, because who doesn’t need comfort food when they travel? This one is pretty straightforward. A cat’s gotta do what a cat’s gotta do. And Cupcake doesn’t understand that you can go in the grass or dirt. She’s litterbox all the way, especially since she has learned to go when I let her know we’re about to go on an outing. For this trip, I won’t have to try to pack litter for her, but I did ship it ahead to my friend who will be driving to our destination. 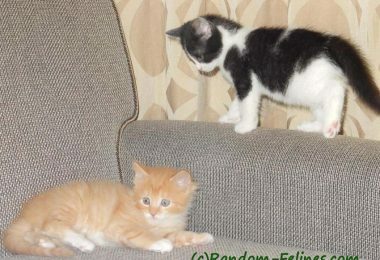 I made sure to get the type of litter she is most familiar with to ease the transition in the strange place. I am also making sure I have plenty of bags to contained scooped litter. During this trip, I’ll be testing two different types of bags intended to keep bears from smelling your food when you backpack with it in the wilderness. If it can keep bears from smelling your food, surely it will keep me from smelling collected litterbox waste, right? We’re going to find out! To make sure Cupcake is as comfortable as possible during our stay, I’m trying to be sure she has many of the comforts of home as are practical. This includes the blanket she always uses when we go places and will have her scent. It also includes familiar toys. She may have to be alone in a hotel room without me part of the time, and I don’t want her to be bored. 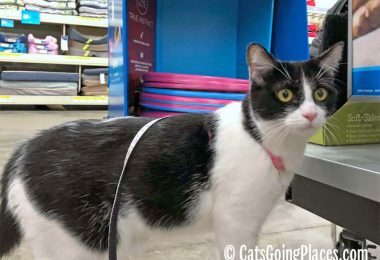 Cupcake is a good girl when we go places, but to keep her safe, she will always wear either her harness or collar, and I am bringing a spare harness, too. They don’t have extras of those in the hotel like they do toothbrushes! One item on the list that might confuse people is carabiners. Carabiners are the spring-loaded clips originally used in the military for activities where people needed to clip and unclip from ropes. They are super-handy for clipping things to the outside of a cat carrier or your carryon bag to help keep your hands free for your cat. It’s polite to leave things as clean as you can after you and your cat stay there. Dog pee pads or incontinence pads under a litter box can help limit the spread of litter. If your cat is a messy eater, you can use them under her food bowl, too. A mini broom and dustpan will help with litter cleanup, and some cleaning solution can and paper towels can help clean up any other unexpected messes. If the messes are on your cat, cat-safe wipes can help tidy her right up. Also, if you are bringing reusable bowls like Cupcake’s collapsible bowls, be sure to pack an appropriate dish soap to wash them. I’m going to use a biodegradable soap intended for campers and backpackers for that this trip. If you aren’t staying at a hotel where you have access to additional linens, bring an extra towel. It’s versatile for cleaning, and your cat can always use it as a napping spot if you don’t need it. 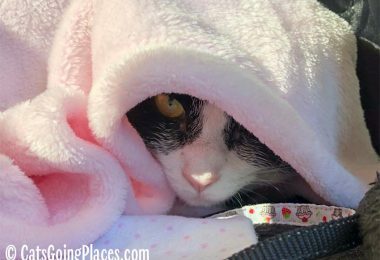 If you are crossing state lines or entering another country with your cat, you may need a health certificate. Check with your airline and/or destination state’s regulations. 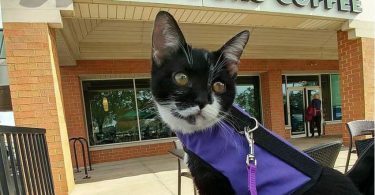 Either way, I always carry a copy of Cupcake’s Rabies vaccination certificate in the pocket of her carrier in case it is needed.  Print a copy of your reservations showing your pet is included in your reservation so there is no confusion at the airport or your destination. A hard copy of your hotel and airline’s pet policy might come in handy, too. 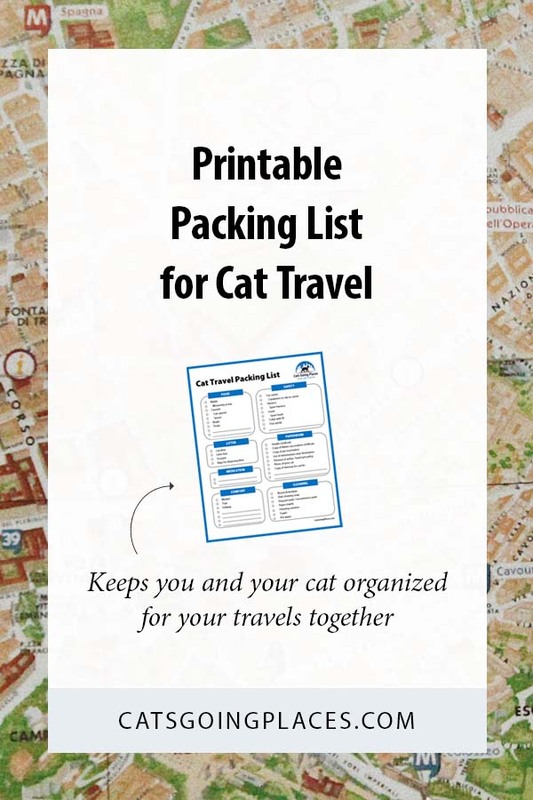 Be sure to put a copy of your itinerary in the pocket of your cat carrier in case an emergency separates you. It’s a good idea to have a hard copy of a photo of your cat in case the worst happens and you are separated, but you can use one from your phone in a pinch. Speaking of emergencies, make a list of veterinarians near your destination, including the nearest emergency vet. 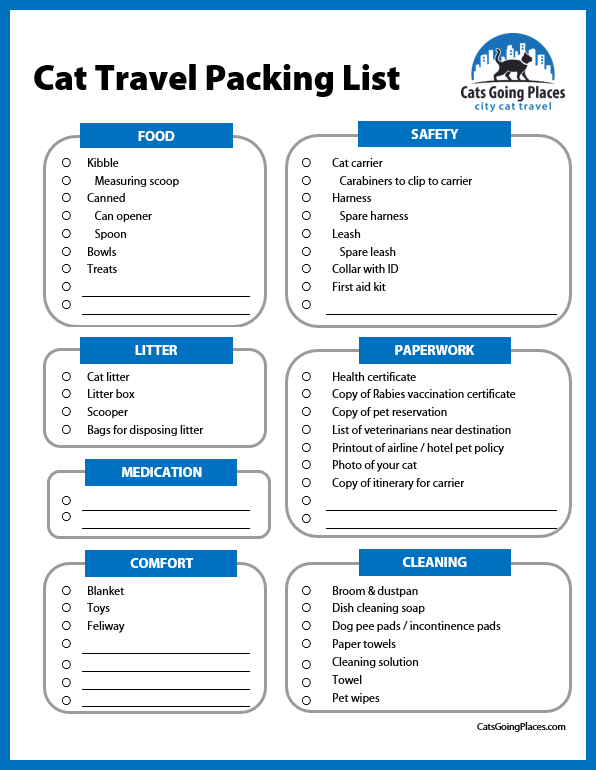 You can view the printable packing list for cat travel below, or download your own copy as a PDF. 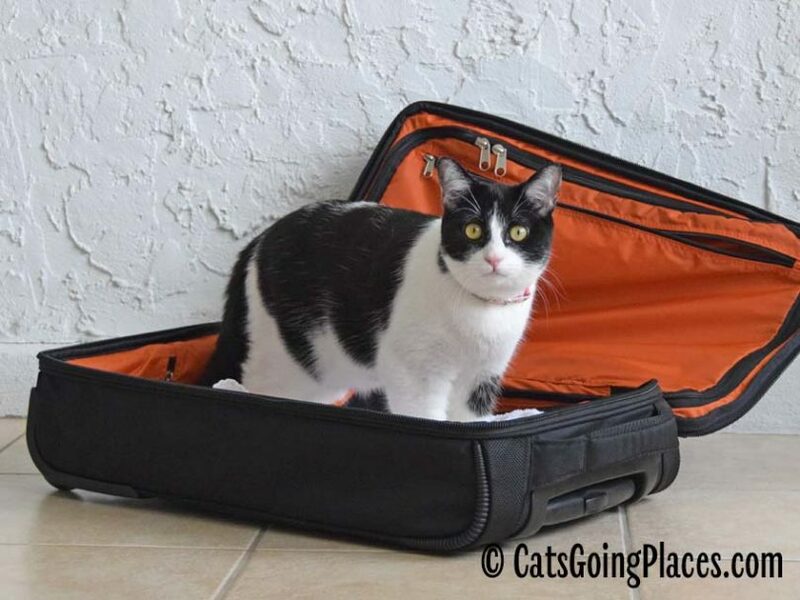 Did it help you pack for the next trip you are taking with your cat? Let us know! Your list looks pretty similar to what we pack for our trips!